In 1950, Scott was invited to be one of the sixty painters (in fact only fifty-four actually exhibited) included in the large exhibition of contemporary painting for the Festival of Britain in 1951, Sixty Paintings for ’51. The key requirement of the works submitted was scale, and as most artists had found difficulty in getting hold of plentiful painting materials in the austere years immediately after WW II, the chance to work on a much larger canvas than was usual brought new challenges. Scott found that ‘the forms I had been using would not easily expand, and I realised that another step towards simplification had to be made.’ His paintings of the early 1950’s demonstrate just how this was achieved, using a brief period of almost total abstraction to learn how to remove many of the extraneous details of the earlier paintings and thus allowing concentration on the few elements still remaining. In the present work, the cluttered table tops and hints of room settings of the pre-Festival paintings have disappeared, leaving only the simplest hint at the form of the table and the space in which it stands. 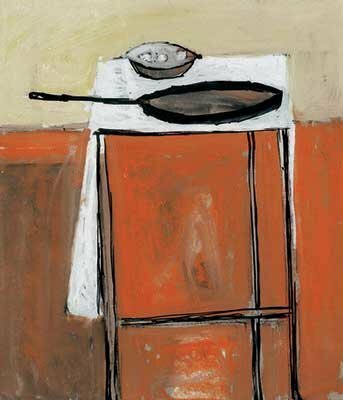 Whilst not completely flattening the picture plane as he was later to do, this simplification allows Scott to achieve a Chardin-like purity in his painting, concentrating the viewer on the balance of forms and the contrast of texture and colour between the crisp white tablecloth, the blackened metal of the frying pan and the vivid reddish-orange of the background. My problem was to reduce the immediacy of the individual object and to make a synthesis of ‘objects and space’ so that the new conception would be an expression of one thing and not any longer a collection of loosely related objects. While working towards this end my paintings contain greater or lesser degrees of statement of visual fact ...Apart from the subject, which I can do nothing about, what interests me in the beginning of a picture is the division of spaces and forms; these must be made to move and animated like living matter. I have a strong preference for primitive and elementary forms and I should like to combine a sensual eroticism with a starkness which will be instinctive and uncontrived.